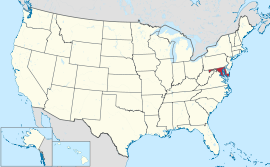 "Old Line State", "Free State", "Little America", "America in Miniature"
Area Ranked 42nd in the U.S.
Population Ranked 19th in the U.S.
Ranked 5th in the U.S.
संयुक्त राज्‍य अमेरिका देशस्‍य प्रदेश: अस्‍ति. ↑ "Maryland's quality of life ranks high compared to other states", FindArticles.com, The Daily Record (Baltimore), December 11, 2004. Retrieved on June 4, 2009. ↑ "Maryland Facts". Maryland Office of Tourism. Retrieved June 2, 2009. ↑ "Great Seal of Maryland (reverse)". Maryland State Archives. Retrieved March 4, 2014. ↑ ४.० ४.१ "Elevations and Distances in the United States". United States Geological Survey. 2001. Retrieved October 21, 2011.